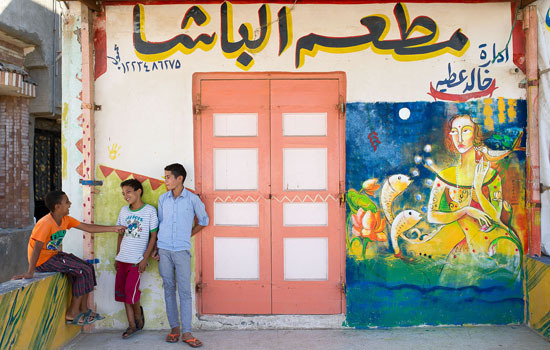 Between 1 and 14 October, a group of artists stepped into the small fishing village of Borg El-Borollos in northern Egypt’s Kafr El-Sheikh governorate, with a campaign aimed at decorating the houses and boats. 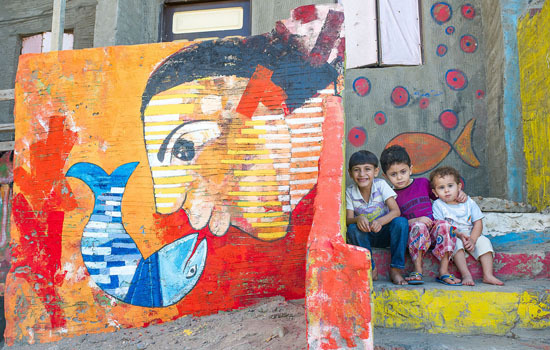 Within a few days, 25 Egyptian and international artists were joined by locals to cover the houses’ facades and fishing boats with colourful drawings. This is the second time that El-Borollos Festival for Drawing on the Walls has come to the impoverished area, with the first festival taking place in October 2014. “The initiative aims to show people what beauty, colours, and art is all about,” Adbel-Wahab Abdel-Mohsen, the mastermind behind the colorful intervention, tells Ahram Online. Abdel-Mohsen also established the foundation which carries his name – Abdel-Wahab Abdel-Mohsen Foundation for Culture, Arts, and Development – and which is directly in charge of organizing the event. The initiative found several supporters, including the Cultural Development Fund, operating under Egypt’s Ministry of Culture. “This year, we invited 25 artists from 10 countries to join the initiative. Along with Egyptians, we also have artists from Bahrain, Jordan, Tunisia, Sudan, and Portugal, among others,” Abdel-Mohsen explains. As he moves across the streets of El-Borollos, Abdel-Mohsen points to walls, balconies, windows which are infused with drawings, scenes from the lives of the fishermen, flora and fauna, traditional motifs, and creative imaginary. “The artists help us reach out to the people. We find that a lot of locals, including children, join us. The take paints and add their share of art,” he comments as we spot a sun drawn by a young girl. Her friend, who is equally involved in the creative process, chooses to paint a large flower. “Everyone enjoys the initiative,” Abdel-Mohsen says, adding that the creative intervention is not limited to drawing on the walls and boats only, but include preparations for the fun of painting, such as cleaning and priming the surface. “We are raising awareness of beauty, which is expressed in so many ways,” Abdel-Mohsen adds. “I am happy that the initiative sees a dynamic cooperation with locals. Together we can change the environment and reinstate new values in the community which otherwise has no contact with art. With time the whole infrastructure of this impoverished area will be redefined. Established in 2014 with the headquarters of Kafr El-Sheikh, Abdel-Mohsen’s foundation does not limit itself to the now-annual El-Borollos festival. “Throughout the year, we hold numerous art related workshops. We reach out mainly to school children, introducing them to drawing and painting and training them with different media,” Abdel-Mohsen explains. With the festival coming to an end on 15 October, the artists will part ways, but they will be remembered with each drawing on the walls and boats. Abdel-Mohsen highlights the warm welcome offered to the whole group from the local community. “People here are amazing. Not only did many of the locals join the drawing process, but they also made sure that we are well fed. They invited us to their houses for tea and dinner. They did not want to let us go until each wall is covered with a drawing. The inhabitants whose house were painted project a sense of pride, leading other locals to ask for their houses to be beautified as well,” Abdel-Mohsen concludes, promising that the next year will see an even bigger color intervention. Cairenes can see samples of the project during an exhibition of the El-Borollos’ painted boats that will be on display in the Arts Mart gallery in 6th of October city, starting 20 October.